play Techmaster's Bassgasm. You'll know for sure. You dont have to use both wires. 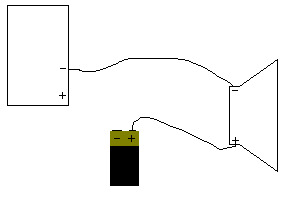 Simply touch the positive lead of the sub to the positive terminal of the 9v battery. If the cone moves out, its wired up correctly and working. If it moves in, its wired up out of phase. It if doesnt move, youve got problems. um... was there an actual answer in this response to a dead 7-week-old thread? But you never know.... more people have Tesla coils than you think! Hell, I dunno, maybe Im wrong. I tried it once several years ago and Im 90% sure I left the negative speaker wire hooked up to the amp and just touched the positive speaker wire to the positive terminal of the 9V. I do remember there wasnt a "pop". The cone moved out and stayed out for as long as I held the wire to the 9V. i just tried it with some speakers with both wires it went "cpop" then thats it . if its practical play a sine tone as its realy easy to detect anything thats wrong. i half blew the bass unit in my missions i hardley noticed it i first got suspicios playing some madonna. but it was verry hard to pick out untill you play a cont sine wave then it was verry obvious. Hmmmm, thats bugging me now. I know for a fact I did it but Im not sure anymore how I did it. Ha! I knew I wasnt imagining things! Right, because thats what I was talking about!! get an ohm-meter (little 10 dollar voltmeter thing from rat-shack - has an "ohms" setting)... put it across each voice coil of the sub... if its 8 ohm voice coil it should read somewhere between 7 and 9... if its a 4 ohm coil.. then 3 to 5... that's DC resistance, but it'll tell you if the coil is fried or not. then... as long as you get resistance... (now you know it wont destroy an amp)... throw it in an appropriate sized box -- or something close -- and hook the **** up... listen to it... hear scratching, it's busted... former's screwed up... sounds good, then it's probably fine. that's the extent of testing i'd do. i still do push on cones sometimes, but when you get to more expensive subs with more precise builds... then pressing on a cone (because we're human and never press perfectly straight down) can scrap a sub on ya. and ya i've done it before. Now if you connected the - of the 9v battery to the chassis them yes it might work but if you just take a wire from + of the 9v battery and connect it to the speaker you will get nothing as you have not completed a circuit for the 9v battery. How do you think the VOM measures resistance? volt/ohm meters measure resistance by placing a voltage across the two leads (red and black... test and common) it then monitors current output through the line and does the simple math. ... a 9 volt is fine. but a 9 volt "home battery" for lack fo a bettery term, isn't going to hurt anything... its maximum current output is pitifully low. go sticking a sub on 12 V car starting battery and you could start problems. however thats just one half of the reason not to sue a battery. the other half is that 9 VDC is often not enough power to make some subs move. low impedance coils coupled with heavy structured woofers and you'll never get enough current out of the battery to make it go anywhere. a nice AC ripple makes subs dribble.. LOL . shoot it with 110 then you'll know it's bad..
... 110V AC wall output juice is what is used to break in some subwoofers. the IDmax dual 4's are broken in by stringing the voice coils of 2 subs together in series and plugging them into the wall. smaller subs... string enough of htem together and u can dothe same... wall power isn't bad at all. The thing I used the 9 volt test for was to check polarity. When I first installed my front and rear speakers in my Ram and wasnt 100% sure Id done em in phase and so rather than pull everything out I stuck the + speaker wire to the + of the 9V and was able to tell without having to pull the door panels off and speakers out and all that crap.